Back in April a Kickstarter was launched to fund the Swedish edition of Shining in the Dark; not only was the project fully funded, but they reached the stretch goal to allow me to do some brand new cover art especially for the Swedish edition. And here is the finished cover. Below you can see the original version I created which included a skull at the top, which I removed to allow more space for the title to go over. The designer was able to make the tentacle that originally went into the skull, interact with the title type, which was a nice little touch. I thought it was a cool idea to link the two covers in this way. It seemed to me that it would be important to still show Marv on the cover as the book is celebrating the 20th anniversary of Lilja’s Library, which he’s the mascot of, and Lilja agreed. So initially I was thinking we shouldn’t do it from Marv’s point of view, but go with a view from over his shoulder so he would still be seen in the image. 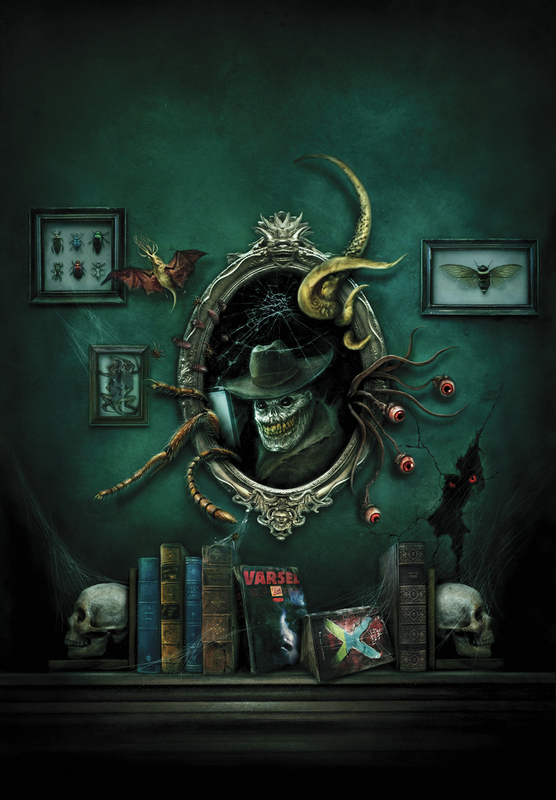 However, doing it this way we wouldn’t get to see Marv’s face, so I then came upon the idea that we could do it through Marv’s eyes, and one of the things he was looking at would be a mirror, allowing us to see his face reflected in it and therefore still have him represented on the cover. Rather than a normal mirror I thought it could be a black mirror, and his reflection would be subtly different, giving him black eyes. 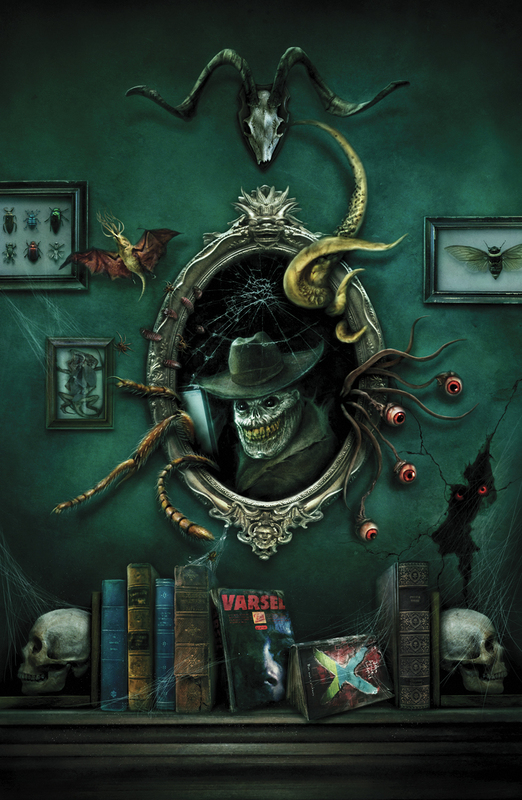 And various creepy things would be emerging from the mirror. Lilja had also wanted to add a Swedish touch to the cover and had the idea to incorporate a Swedish edition of a book into the image somehow that Swedish fans would recognise. Lilja was able to get permission from the Swedish publishers to incorporate some of their Swedish covers into our image in this way so I included a row of books on top of a mantelpiece which include the Swedish editions of Stephen King’s The Shining and John Ajvide Lindqvist’s X: The Last Place. 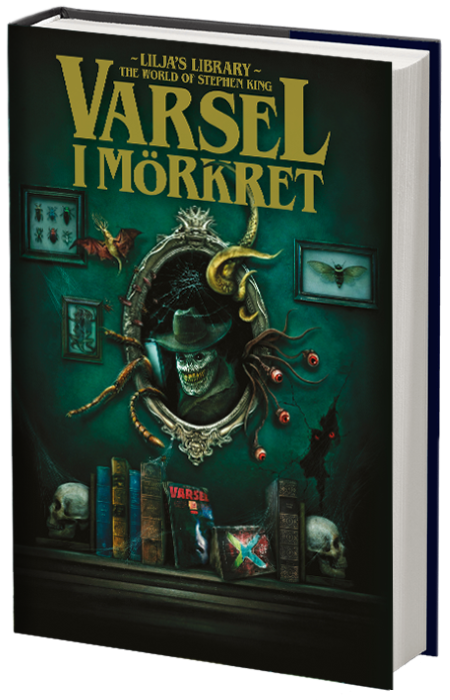 The Swedish edition of Shining in the Dark, titled Varsel i mörkret, will be out this year from Apart/Swedish Zombie. Amazing! Awesome! Incredible! You’ve outdone yourself!